It’s been an interesting couple of weeks for the Anstead family when it comes to fun news. Just one week ago, the Ansteads announced they were expecting a baby later in 2019 to add to their newly-formed family unit. Now, we’ve learned through the power of Instagram Stories that Christina Anstead (nee El Moussa) has gifted Ant Anstead with a vintage car for his 40th birthday. What’s going to happen next week? The Anstead kids perform at Carnegie Hall? Okay, so maybe things won’t get that much more extra around the Anstead house, but even so, we’re marveling over the level of luxury involved in Christina’s gift to her car-loving husband. As if it wasn’t enough that Ant was already around fabulous cars thanks to his day job as the host of UK TV show Wheeler Dealers, now he gets to bring his work home with him. 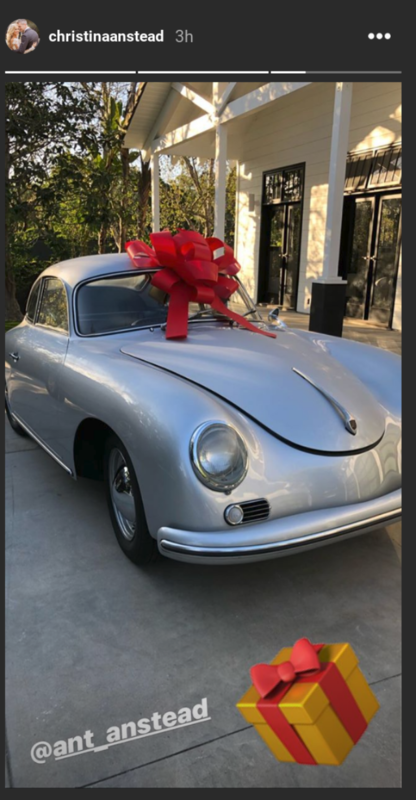 According to People, Christina found the perfect gift in the vintage 1958 Porsche 356A/1600 Reutter Coupe Christina purchased from an older gentleman living in Ohio. Christina showered her husband with with affection, posting a touching birthday tribute for him on Instagram, too, using the power of the emoji to convey all of her thoughts about her special guy as he celebrates a milestone birthday. Between getting the girl, growing his family and now getting to enjoy a new car, we’d be forgiven for thinking everything is coming up Ant at this moment in time.